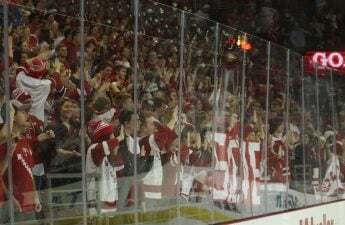 The University of Wisconsin men’s hockey team continued their momentum over the weekend, sweeping Michigan State in East Lansing to win their fifth straight game, marking their longest winning streak since 2013-14. The Badgers (15-8-1, 8-2-0-0 Big Ten) came into the weekend already having played Michigan State in a series at the Kohl Center earlier this season, taking care of the Spartans (5-17-2, 1-8-1-0) by a score of 5-1 in both games. Wisconsin picked up right where they left off against MSU when they visited Munn Ice Arena over the weekend. The Badger offensive erupted for five goals in the first 30 minutes of the game en route to a 6-3 victory. The scoring frenzy started just 5:28 into the game, when freshman Trent Frederic netted a wrist shot off a pass from Jake Linhart. The Badgers doubled their lead just 3:27 later thanks to a goal from captain Luke Kunin — his 16th of the season. 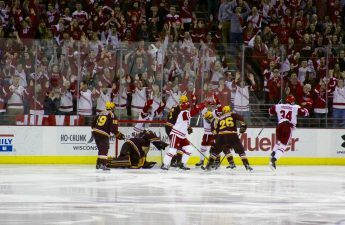 The Badgers then capitalized on a five-minute major for a knee-to-knee contact hit that forced Tim Davison to leave the game. Will Johnson took advantage of the power play, giving UW a 3-0 lead heading into the first intermission. After an electric opening period, the Badgers kept laying it on in the second, with a goal from Aidan Cavallini to extend their lead to four. The Spartans were quick to respond, however, with a goal of their own just 50 seconds later to make it 4-1. As was the case for most of the weekend, the Badgers responded to the Spartans with a goal of their own. Junior Ryan Wagner notched his sixth goal of the season on a feed from Cameron Hughes to restore UW’s four-goal lead going into the final period. Michigan State clawed their way back in the third, scoring two goals in a 2:45 span to bring the score to 5-3 with just over seven minutes remaining before the Badgers shut the door defensively. Frederic officially sealed things up on an open-net goal with :12 seconds left to give UW the 6-3 victory. Wisconsin returned Saturday night for a much harder-fought game, winning an overtime game for their second straight weekend. The hard-fought game went back and forth throughout, with the Badgers striking first on a short-handed goal from Kunin with 1:51 left in the first period to give them a one-goal lead heading into the second period. The second period saw Michigan State score two unanswered goals and take their first lead of the series, going up 2-1. Their first goal came eight minutes into the middle frame, when Rhett Holland converted on the scramble in front of UW’s goal. The goal also prompted a fight to breakout. Defenseman JD Greenway was subsequently slapped with a five-minute major, disqualified and suspended for the next game for fighting. Michigan State worked this momentum in their favor, scoring again with four minutes left in the period to give them a 2-1 lead heading into the final period. 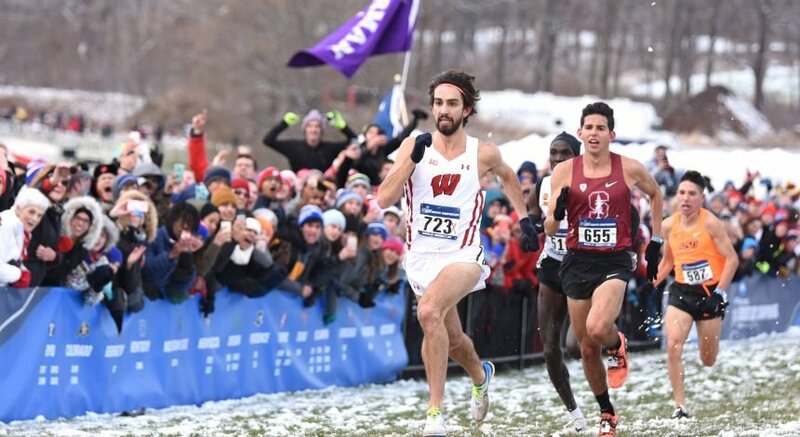 Wisconsin responded again, with Frederic and Cameron Hughes scoring two unanswered goals to take the 3-2 lead with just under 10 minutes left in the game. The Spartans didn’t go away easily, though, as they pulled their goalie late in the period and tied the game at three with just 1:20 left, sending it into overtime. Goaltender Matt Jurusik came up big in the first minute of overtime, making key saves before junior defenseman Linhart scored the game-winner just 1:34 into extra time. The hard-earned win gave the Badgers a season sweep over the Spartans, the first time UW has completed a season sweep since the inception of the Big Ten in 2013-14. Now halfway through conference play, Wisconsin sits atop the Big Ten in a first-place tie with border rival Minnesota. 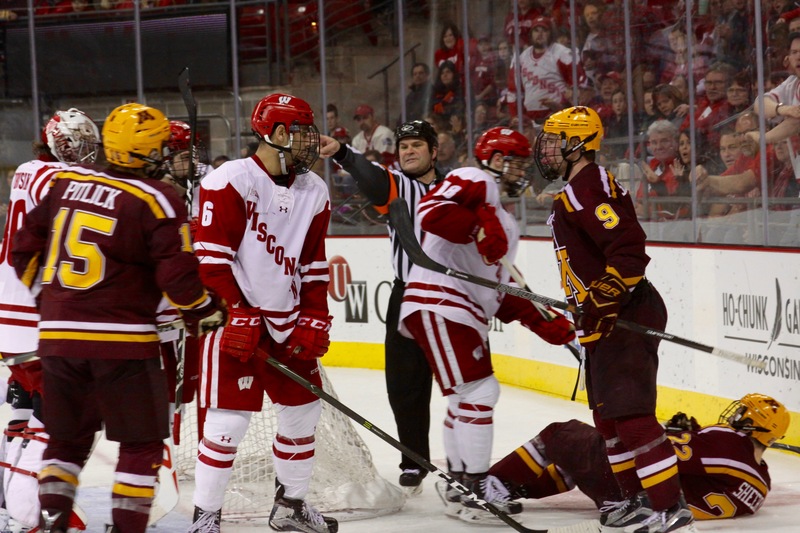 The Badgers face off against the third-place team, Penn State, next weekend at the Kohl Center. The Nittany Lions are ranked 10th nationally, and UW owns a 5-3 record against ranked foes this season. The puck drops at 7 p.m. both Friday and Saturday.